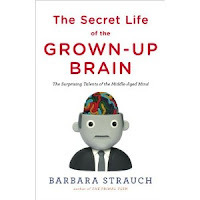 Barbara Strauch's book The Secret Life of the Grown-up Brain is about how our brains unlike most parts of our bodies is not simply subject to decay from age 35 or so on. While certain brain functions do indeed suffer (for instance our ability to remember names), in many aspects the functioning of the brain is actually improving: we become better at pattern recognition, we make better judgments due to our tacit knowledge, and we generally develop a more positive outlook on life as we grow older. The book debunks the idea that from a certain point, somewhere around 40, we are over the hill and from that point on we only have one way to go: downhill. While we grow older our bodies do decay in many respects, many of our brain functions can keep on going uphill well into old age.